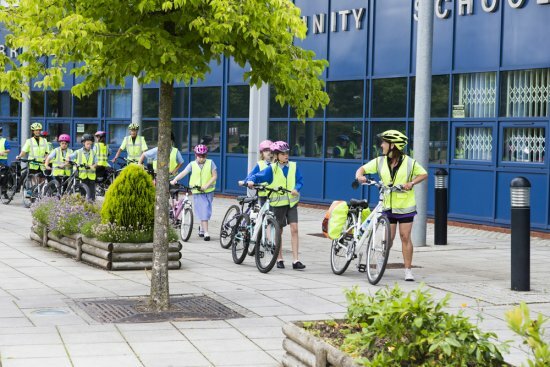 Pupils from Wheatfield Primary School took part in a ride to Bradley Stoke Community School to help them learn a cycle route ahead of the transition to secondary education in September. The aim of the transition ride is to build confidence and improve riding skills. As part of the cycle they are shown where to secure their bike and safety gear so there are no big surprises on the first day of term. Pupils arriving at Bradley Stoke Community School. A further session is due to take place on Monday 14July from The Ridge Primary School travelling to Brimsham Green School, Chipping Sodbury School and Yate International Academy. Transition rides have been funded by the Local Sustainable Transport Fund Active Travel to school project. Strong links between primary and secondary schools has ensured that more pupils have taken part this year. Last year two secondary schools took part and this year we have been able to offer transition rides to seven secondary schools. Pupils from the following schools have already taken part including St Stephen’s Primary to Mangotsfield Secondary School and from Baileys Court Primary to Bradley Stoke Community School, Abbeywood School and Winterbourne Academy.